The Hon. Robert Conyers was a distinguished member of the San Diego Superior Court trying complex criminal cases where he was known for never diminishing the dignity and self respect of the person he was sentencing. Appointed to the Superior Court bench in 1959 by then-Gov. Edmund G. “Pat” Brown, he was appointed to sit on the court’s appellate department. In 1976 he was named presiding judge of that department. Having grown up in Chula Vista, Judge Conyers received his undergraduate degree in business administration from what was then San Diego State College in 1938 and his law degree from Boalt Hall School of Law at the University of California Berkeley in 1941. Preceding his 20 years on the bench, Judge Conyers had his first job as a special agent for the FBI, stationed around the country to work primarily on espionage prevention. After passing the California bar exam in 1946, he entered into private practice with Lowell Davies before joining Higgs Fletcher & Mack where he specialized in probate and real estate law. He served the San Diego County Bar on its Board of Directors and was elected to serve as its president in 1958. He was a founder of the Bar Association’s monthly publication Dicta for which he wrote regularly. His love of writing extended beyond the bar, and he was a member of the Sunset Cliffs Literary, Poetry and Philosophy Society. A prolific writer, he was working on a review of the Thomas Jefferson’s Bible at the time of his death. He was also a regular contributor to the newspaper in alpine, where he lived since his retirement in 1979. 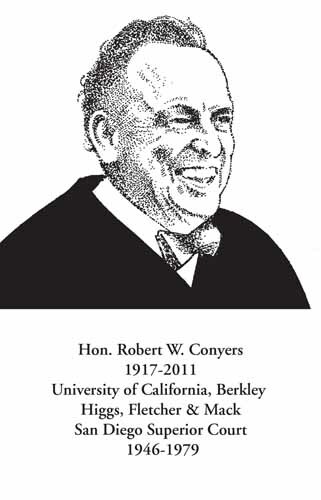 Judge Conyers community involvement extended well past his writing and involvement with the bar. He was also a former member of the Democratic Professional Men’s Club of San Diego and The Chapter.